I was finally able to harvest some of the lettuces I planted in my garden for this weeks meals. 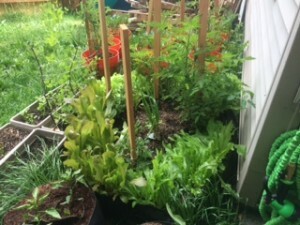 The leaf lettuce, sugar snap peas, and radishes are doing really well. 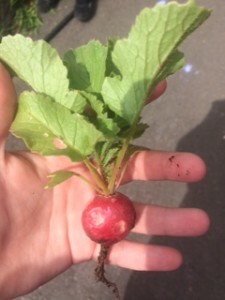 The kids were really excited when we got to pick the first radish out of the garden. It was a little spicier than I expected, and I even made sure to follow the instructions on the seed packet to keep them well watered to prevent them from being “hot”. I live in the rainy Pacific Northwest with lots of rain for Pete’s sake! On top of rainfall, I have religiously watered the garden. 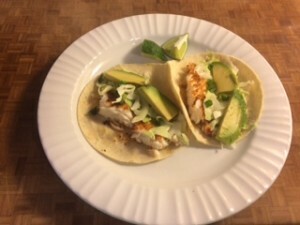 The slight spicy radishes are still good, especially on fish tacos! I like the peppery bite of thin shaved radish on top of the buttery lettuce I’ve been harvesting form the garden. I haven’t bought lettuces for over 2 weeks and have been picking exclusively from the backyard. It grows back faster after it’s cut, I swear. I think I have more lettuce than I started with! I really hope the tomato plants take off like the that…they have lots of blossoms, but the weather has been so chilly lately that most of the plants in my garden seem to be on pause. The pea shoots are really tall, but I can’t tell if the pea pods are actually growing yet or if the kids are picking them off and eating them as soon as they grow. of broccoli. It was no surprise that Brickman choose to plant broccoli when I asked him what he wanted to grow in the garden. We have 6 broccoli plants, 3 of which have started growing tiny florets and Brickman is SOOO EXCITED! With the abundance of lettuces I have to use, I have no excuse not to eat healthier. I incorporated salad as a side dish in the menu a few times this week because the lettuce mussgo! Apple cider braised cabbage -the caraway seeds make this dish AMAZING! Camping Firsts and bread baked over the campfire! 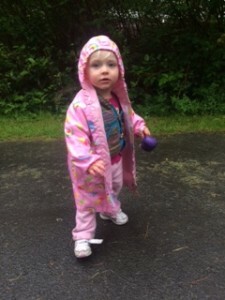 This past weekend was our first camping trip of the year, and it was full of firsts. It was Baby’s first time camping, the first time the older 2 kids slept in their own tent, and the first time I baked over a campfire in my dutch oven. Even with all the new experiences, it was a pretty smooth weekend. Since it was the first time we were camping with Baby, I booked a campsite just a few miles down the road so we could bug out if things were not going as planned. Well, things didn’t go as planned, but it still went okay, we just ended up camping in the rain. Husband got the tents set up while I started the fire and got dinner cooking. Brickman and Fancy kept an eye on Baby while they all played at the park…I planned ahead an booked the campsite that backed right up to the playground because I knew that’s where the kids would be spending a lot of time. After I got the fire going, I put the cast iron dutch oven on the grate to preheat while I dug out the rest of the food. 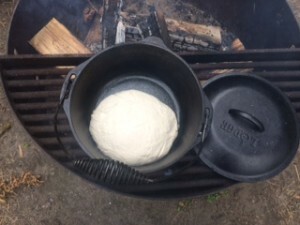 Once there were some nice hot coals, I put the bread dough I made at home into the dutch oven and had to find a way to transfer hot coals to the top. I had packed a pair of grilling tongs which did the job…at least until they broke later in the weekend. 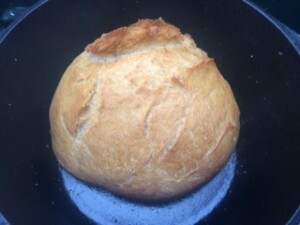 I only opened the dutch oven once to check on the bread to make sure it was rising and baking, and I think not fussing with it is important. I did have to move around the cast iron dutch oven a bit so that I could cook up the rest of our dinner. Along with the bread, we had zucchini, summer squash, and mushroom foil packets, sweet a pple chicken sausages, and a box of shells and cheese for dinner…all cooked solely over the campfire. The bread was smelling delicious, so I knew it was time to take it off of the fire. For my first time, it turned out pretty well. The bottom was a little burnt, so next time I will have to add more hot coals to the top to get a more even bake. I can’t tell you exactly what I did, but here is the bread dough recipe I started with. I did let the bread rise a long time, but punched it down twice during the day before throwing it in a well oiled zip-top bag for transport to the campground. Once the dutch oven was ready, I just dumped it in, put the preheated lid on it, and hoped for the best. With the burnt bottom of the bread cut off, it was some of the best bread I’ve ever eaten. My family agrees, and Brickman has asked me multiple times to make it again. Once we got dinner cleaned up, we had a lot of fun hanging out with some new friends making s’mores around the campfire. I saw a new s’more recipe on Pintrest and decided to give it a try since it only had 2 ingredients…marshmallows and fudge striped cookies. 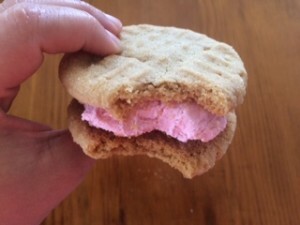 I liked them better because it eliminated the crumbly graham cracker, plus the chocolate next to the marshmallow was thin enough that it melted slightly. I didn’t snap a picture because it was dark and we had 6 littles 8 years old and under with hot sticks around a fire. When the fire finally died down, I had some dirty but exhausted kids. They all fell asleep quickly, even though the big kids had some apprehension about sleeping in a tent without us. I could only drift off before worrying about baby co-sleeping in our double sleeping bag. To make sure she was okay ( and had full access to her “milkies”), I didn’t have a blanket to cover my upper half most of the night. Did I mention the temperatures dipped into the 40s? I was quite chilly, but enjoying the sounds of the outdoors and the steady sound of rain hitting the tent. When we got awake, everything was soaked and it was still raining. I was exhausted and Husband was a little under the weather from partaking of too many libations the night before. We decided to head home to make breakfast and grab a nap. 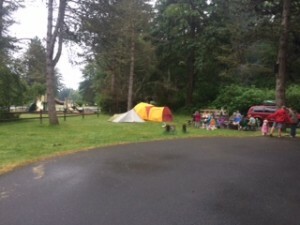 It stopped raining in the afternoon, so we decided to go back to camp…only to have it start raining again on the drive. Luckily, it was only a light drizzle that only lasted an hour. We toughed it out and I cooked dinner for my family and some of our friends over the campfire again. This time I baked up a peach cobbler in the cast iron dutch oven. It tasted pretty good ( Hey, it wasn’t burnt! ), but would have been better with some ice cream. I really need to look into getting one of those camping ice cream ball things. 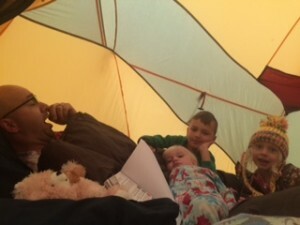 We decided that Baby and I would go home to sleep and that the kids’ friends would sleep in the tent in our place. I would just go back and pick them all up in the morning. Overall, I think it was pretty successful. 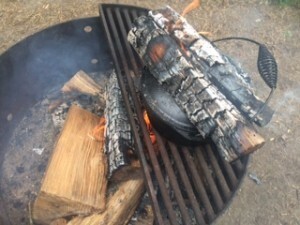 I want to do more dutch oven campfire cooking, the kids were happy, and we made some great memories. Hopefully, next time the weather will cooperate more, but we do live in the Pacific Northwest, so I won’t bet on it! Cheese is probably my favorite food…the thing I would choose if I could only eat one thing for the rest of my life. My love of cheese started as a kid when my Poppy ( Grandpa) would bring home logs of cheese or squished cartons of ice cream or other dairy products from the dairy where he made cottage cheese. I remember having deli sized logs of provolone cheese in my fridge and smashed boxes full of perfectly fine strawberry shortcake crunch bars in the freezer growing up. I even got to go visit Poppy at the dairy to see him making the cottage cheese. Let me tell you, curdling cottage cheese is one of the WORST smells I have ever smelt in my life, and I’ve worked in a hospital! I’m glad that I just got to eat all of the creamy delicious dairy products though, and still keep my fridge well stocked over stocked with different cheeses…I even keep extras in my freezer! I have talked with Husband about having a small farm with sheep or goats once he retires from the Coast Guard and we finally settle down. Id like to try to make homemade cheese from farm fresh milk. I have limited experience in making breast milk cheese for Baby to eat, but after watching the Cooked series on Netflix, I really want to learn more about natural cheese making for the rest of us to eat. 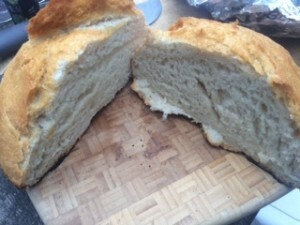 I know how much better homemade bread is compared to store bought, and I want to be able to eat cheese that is at the homemade level of deliciousness too. Having everything I need to make that farm to table cheese happen is a long way off…IF we ever settle down. We have definitely embraced this nomadic lifestyle and get the itch to move every few years. There are so many awesome areas to explore to stay put in any one place for too long. In the meantime, I will continue to buy too much cheese and use it in recipes like mussgo mac and cheese made using up the bits of cheese in my fridge before they get too funky! 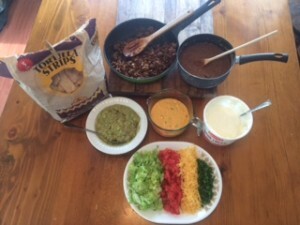 Use leftover sloppy joe meat and nacho bar leftovers to make chili. 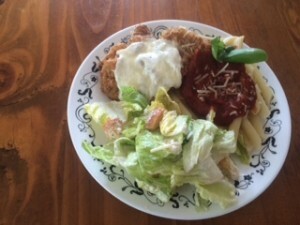 Boil water and cook the pasta to al dente and drain while making the cheese sauce. Melt the butter in a large sauce pan on medium heat. Add in flour to make a roux and cook for 1 minute. 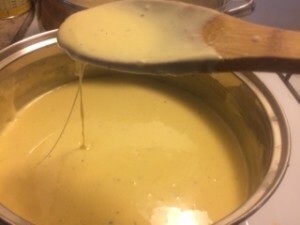 Slowly whisk in the evaporated milk and regular milk, then add ground mustard, salt, and pepper to taste. Add in cubed Velveeta and stir until melted…this step is important because I find it gives the cheese sauce the best consistency. Add in other cheeses and stir until melted. 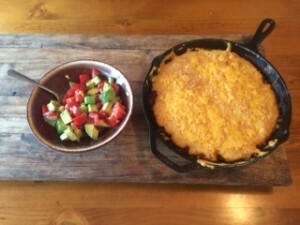 Make sure you are scrapping the bottom of the pan to not scorch the cheese sauce. Add drained pasta to cheese sauce and stir. 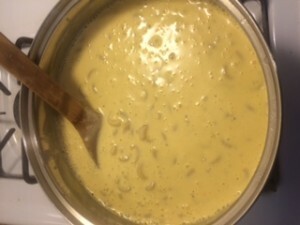 It will look like cheese soup, but that extra liquid will be absorbed into the pasta while baking. 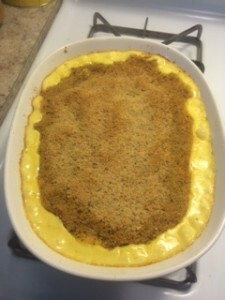 Pour “cheese soup” mixture into greased casserole dish and top with bread crumbs (store bought or make your own by toasting the heels of a loaf of bread, spreading with butter, and crumbling) or cracker crumbs ( great way to finish off a sleeve of crackers that may be getting stale). Bake at 350 for 20-30 minutes. I take a waste not want not approach to cooking. I saw that I had a bunch of cheese bits left in the fridge and knew I needed to use them before they got covered in mold, so I incorporated mac and cheese into this weeks menu. The boxed stuff with powdered cheese product doesn’t even compare in taste, and this doesn’t cost much more to make (you would have ended up throwing that cheese out anyway)! I come up with a lot of my best tasting dishes by using up the stuff that’s been hanging around in my fridge for a while, so I’m sure you’ll see more of these mussgo creations in the future…they probably will contain cheese! 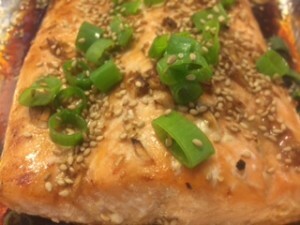 I’m trying to stick with some simpler meals that are quick to make, grilled outside, or can be thrown in the crock pot for a prep and forget dinner. 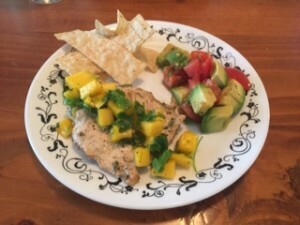 As the summer gets closer, it seems my life gets more hectic with kids’ activities and family weekend camping trips, so I am trying to get some freezer meals made before summer vacation gets here and we spend lazy days on the beach. As a mom a beach day is anything but lazy…constantly doing head counts, reapplying sun block, and telling Baby to not eat the sand. Gone are the days of relaxing ocean side and loosing myself in a good book for the afternoon. Those days will come again, so I will enjoy building sand castles and jumping over waves with my kids this summer while they still want to play with me. Meanwhile, I still need to feed these rambunctious kids of mine, and the older 2 definitely have the veracious appetite of growing kids. I’m glad the the produce prices are dropping as new crops are being grown more locally. 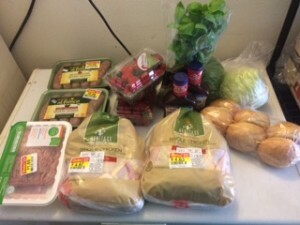 I look at the produce sales each week and buy those fruits and vegetables and plan my meals around them. I can’t wait until the price of sweet corn drops and we can throw it on the grill to get a nice charred flavor. In the meantime though, I’m taking full advantage of the asparagus that is in season and throwing that on the grill or in a quiche in this weeks meal plan. I need to take the picture of the food faster too, it seems like it has been disappearing into my hungry kids’ mouths before I got the chance snap a picture for the blog. Use the Chicken roasted last week or rotisserie chicken from Costco! Top leftover chicken tortilla soup with a prepared box of cornbread mix for a Mexican casserole…Add tortilla chips to thicken soup if it is to thin. Thursday really is going to be mussgo out the fridge day for us and not re-purposing it and taking the chance of creating more leftovers. We are going camping over the weekend for 2 nights, and I want to try my hand at campfire cast iron baking. It might be too ambitious, as it will be Baby’s first time camping, so we shall see how it goes. I’m hoping to try to bake up some homemade bread and a peach cobbler in my cast iron dutch oven over the campfire, so I must go do some research on that. I hope to post how the dutch oven campfire cooking turns out as well as let you know how our weekend camping trip turns out in my next post. May the 4th (be with you)! My Husband and son, Brickman, are pretty big Star Wars nerds, so we started a tradition of celebrating May the 4th. For those of you not into Star Wars, May the 4th be with you is a play on words for May the Force be with you…a big tag line in the Star Wars flicks. With the recent DVD release of Star Wars: The Force Awakens, Brickman was even more excited for May the 4th this year. He is a very caring and empathetic boy, so he understood when I said I didn’t know if I would be able to do anything special this year to celebrate since it was a school night. 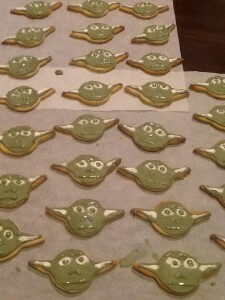 In years past, I made the cut out Yoda and Darth Vader cookies with royal icing decorations in the picture. These took me a whole Saturday to make from scratch, and I knew I just couldn’t pull that off today with Baby running around. Brickman is so sweet and helpful, so I really wanted to show him how much I appreciate him. Husband happened to have the day off to study up for the May service wide advancement test he is taking tomorrow, so I decided to try to do at least a little something Star Wars themed. With the extra set of eyes to help look after Baby, I was able to plan and make some special treats to surprise him. After Baby and I got home from the grocery store, I put on a pot of water to boil to make a pan of Jigglers. I just poured the hot Jell-O into a greased baking sheet ( I think the one I used was 14×11) and put it in the downstairs fridge to cool. 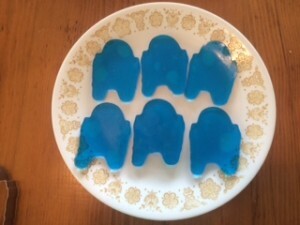 Later, I cut them out with a R2-D2 cookie cutter to make a fun Star Wars themed treat with not much effort. I also bought a personal sized watermelon that was on sale for $1.88 at the grocery store, so I had my husband carve it into the Death Star. He did it all from memory, so I was impressed at how well it came out. He used a measuring cup to scoop out the super laser part of the Death Star and just a pairing knife for all the other cuts. 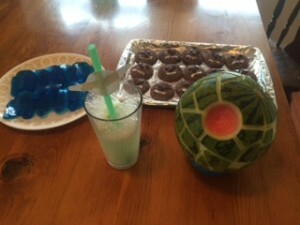 his trick was to use painters tape wrapped around the melon to ensure straight cuts. I made some Yoda Soda by scooping some lime sherbet into a glass and topping it off with lemon-lime sparking water. 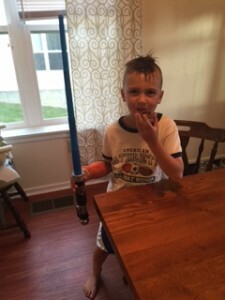 A lot of recipes call for adding in sugar, but my kids don’t get soda often, so they didn’t know it wasn’t very sweet. I used a Yoda shaped cookie cutter to trace out a Yoda head and attached it to a straw to complete the special drink. It probably would have been faster to just find a printable on the internet though. 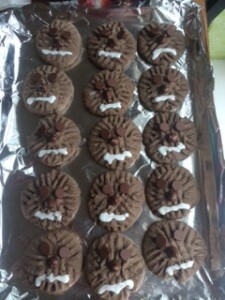 The most labor intensive treat I was going to make was Wookie cookies. I saw this recipe and made the dough using only 1/4 cup of dark chocolate cocoa powder instead of 1/2 cup of regular cocoa powder. My cookies were a little wet when I rolled them out, and I couldn’t find my gingerbread man cookie cutter. After a quick text to my Coastie friends to see if i could borrow one, all we came up with was a kicking ninja. So, on to plan B…I came up with my own design that worked better with the wet dough. 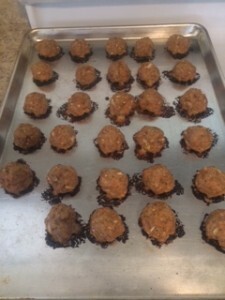 I rolled the chocolate dough into balls, then used the tines of the forks to flatten out the cookie into a shaggy looking round that resembled a Wookie head. After baking, I added chocolate chips as the eyes and nose while the cookies were still warm so that they would melt and attach to the cookie. Finally, I made a 1/2 batch of this royal icing to make a mouth on the Wookie face. 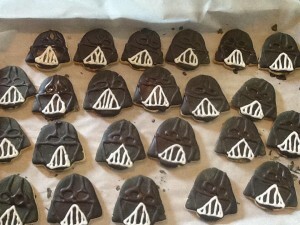 I finished the cookies just in time to take them along to the bus stop so that Brickman was surprised and able to share the May the 4th fun with his friends. He was very excited when he got home and saw all the other treats I had made. The treats quickly disappeared between my 3 kiddos and at least 3 of the neighbor kids as they watched the new Star Wars movie. 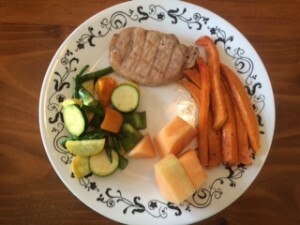 Hopefully, I didn’t ruin everyone’s dinner to much…I know my kids still ate there dinner without mush complaint. It makes me happy to be able to use my skills in the kitchen to make special traditions with my kids. sometimes I wonder if all the time spent is worth it, but then seeing the kids’ faces light up at the end result is all the affirmation I need to know it was indeed worth it. So while waiting at the bus stop with one of my Coastie wife friends, it was brought up that some of my recipes are a little involved for the more novice cook or busy parent. 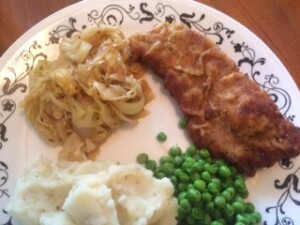 This week, I tried to simplify the menu a little and plan meals that can be prepped and cooked quickly and have side dishes that can be bought at he store, such as bagged coleslaw or pre-cut frozen veggies. Remember that I link the recipes to most of the dishes, so all you need to do is click on the dish and it brings up the detailed recipe. If you didn’t score a good deal on a whole chicken like I did last week, feel free to just pick up a $4.99 rotisserie chicken from Costco instead of roasting your own on at the end of the week. I try to not buy many pre-made or processed foods, but they are great shortcuts when you are short on time. Instead of making your own sauces and dressings, there are some delicious bottled ones available at the store. You can buy your bread products instead of making them from scratch. I have to tell you though, that once you take the plunge and make homemade breads, you will quickly learn how easy it is as most of it is down time for rising. There is nothing quite as satisfying as smelling the delicious aroma of baking bread and then taking a bite of warm bread fresh from the oven. I’m posting the menu a bit earlier this week too, to give you extra time to go to the store…the struggle is real with kids in a shopping cart! Use tonight to roast a chicken simply seasoned with season salt, cool, and refrigerate. I will have 2 recipes to use this roast chicken to make 4 freezer meals in next Saturday’s meal plan. If you don’t have the time or energy, simplify by picking up a rotisserie chicken from the store. 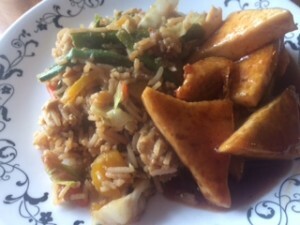 Well, after seeing my food photos, I must go clean off the camera or my iPhone so that my food looks as good as it tastes for next time! 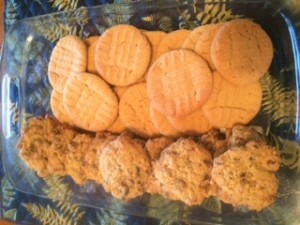 I’d like to think that I am a pretty good cook and baker. I hear from my family and friends that the food I make is delicious, so it must be true. However, some days things just don’t turn out in the kitchen. I can’t always put 100% focus on creating meals and baked goods, and sometimes I fail. Even the best cooks have bad days. Add in kids running towards the hot open oven, spelling word practice, and other distractions dinner can turn out as a disaster. Well, I had one of those days when I was making mussgo pizza from leftover pork and pineapple kabobs. I got distracted by Baby getting into the flour and forgot to put cornmeal on my pizza paddle. Needless to say, the dough got stuck and made a mess when I finally got it transferred to my preheated pizza stone. 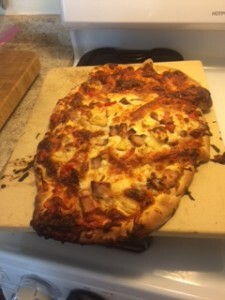 I was able to salvage some parts of the pizza that didn’t get all crumpled up or get burnt from hanging over the edge, and it tasted good. However, there wasn’t enough good parts to serve up to my family. The pizza must go to the dog’s bowl and I was really glad to have the convenience of a hot Costco pizza for less than $10 only minutes down the road. 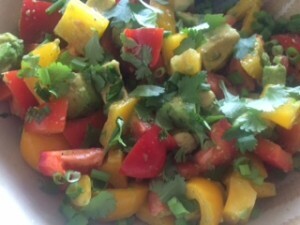 As my husband says, most of my food is great, but we all need to have failures to learn. 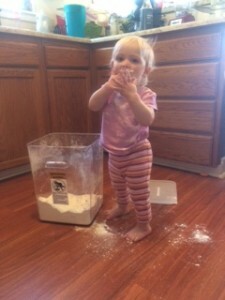 After this experience, I made the kids some cloud dough since they love getting into my flour. 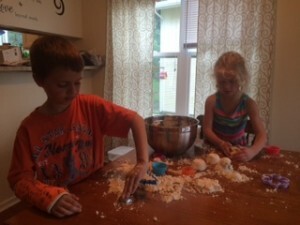 It provides them with a great sensory experience and gives me a few minutes peace to focus on making dinner. Cloud dough is non-toxic and edible because it is just 8 cups of flour with 1 cup of vegetable oil mixed together until it holds together when squeezed. It is moldable and my toddler and older kids love to play with it. Fancy molded and played with the dough for over an hour! Unfortunately, it is messy and takes a while to clean up. After giving the kids showers, sweeping up the floors, wiping up the table and chairs, I wasn’t as sold on the idea of the cloud dough. I “accidentally” threw it in the trash while cleaning up. Maybe we will make it again in the summer when they can play with it outside, but for now it is more mess than I am willing to deal with…the day-to-day messes of our family of 5 and a dog is more than enough to keep me busy. Hopefully, this week’s meal plan will save us both some time as we deal with all the messes life throws our way. I have the attitude that I can’t have it all and I’m okay with that. 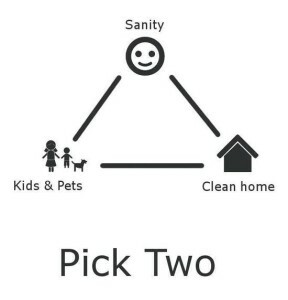 I love this diagram, because it is so relevant to my life. The 2 things I can balance change day by day, minute by minute, but that keeps life interesting. Now I must go tend to Baby’s dirty diaper…that counts as kids and cleaning, right? 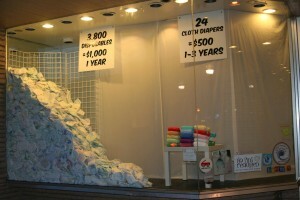 Earth Day seems like a GREAT day to talk about cloth diapering. The way I look at it, cloth diapering is all about saving green. I decided to cloth diaper to save money, but it definitely has the benefit of being more environmentally friendly than disposable diapers. I’m happy I can say I’m doing my part to keep the Earth in the best condition I can for future generations. I’m not so sure how much money I am saving anymore, since buying all the cute prints can be addicting. Yes, there are lots of 20% off sales today, but that is still 80% that I have to pay, plus extra shipping charges for another diaper I don’t really need. 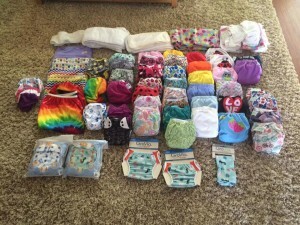 Baby‘s My stash is up to 40 cloth diapers in various styles and various brands. 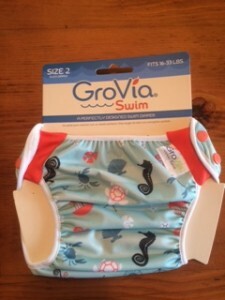 Lately, I’ve been on a GroVia kick and have been wanting to get a cloth diaper in each of the prints and solid colors that they have available. I guess I’ve become a cloth diaper collector…yeah I know, they are just poop catchers, but fluff butts are so cute! Alas, I’m not the only one who has been sucked into buying all the cloth diapers. The Chesapeake Bay print swim diaper in the picture is a special print swim diaper, of which I was able to snag 2 of at retail price ($14.95), are now selling for $67 each on eBay! I just wish I would have started using cloth with my oldest, instead of starting when Baby was 7 months old. I think I’ve spent about $400 on all my cloth diapering items, including the washing supplies. I was lucky enough to score some pretty sweet deals on Black Friday and received some diapers from family and friends as gifts for Baby. I didn’t invest all of that money up front either. After trying out cloth diapers through The Rebecca Foundation’s Cloth Diaper Closet for 3 months, I was able to save up the money that I wasn’t spending on disposables to start my own stash. I started with just 6 “china cheapies” I ordered off of Amazon for less than $30 and a waterproof diaper pail liner for about $12. Then, I ordered the same set of diapers in different prints so I wouldn’t need to do laundry daily. For the same cost of 2-3 months of disposable diapering supplies, I was able to get 12 cloth diapers with microfiber inserts and 4 bamboo booster inserts, plus the pail liner. When I switched to cloth wipes, I just cut up receiving blankets that I no longer used into squares, I didn’t even bother sewing the edges and haven’t had any issues with the threads unraveling. Next, I ordered 2 GroVia O.N.E. diapers to use overnight to get Baby out of disposables completely. I could have stopped there and would have only have spent about $120 on diapering supplies and another $24 for the Powdered Tide to launder them. However, I wanted to increase the days between laundering to 3 days, so I decided to get more diapers and now am addicted to all the cute fluff as you can see by my stash shot! The good news is, if I ever can let go of my precious diapers, I should be able to recoup 1/2 to 3/4 of the cost through resale. There are cloth diaper options for every budget, and many cloth diaper loan programs that are a great way to save some money to buy your own diapers. With all the different styles and manufactures of diapers, there will be one that fits you baby well and you will fall in love with. Buy used diapers instead of new to save even more money…there are always for sale posts on online cloth diapering groups or Craigslist. So whether your goal is to be green and keep disposables out of landfills, or save some green buy having reusable diapers, cloth diapers are the way to go. 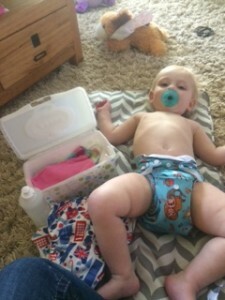 To help you decide what to try first, I will do a follow up post in the near future of the all the different kids of cloth diapers out there to choose from. I never knew there were so many options, or that cloth diapering would be the “hip” new trend. Anyway, I must go stalk the Earth Day sales before all the other cloth diapering mommas crash the server or buy all the diapers! I finally got to the store to restock my pantry shelves and freezers. I ended up spending $480 at Costco, but $110 of that was renewing my membership fee. I get the executive membership because we buy most of our groceries at Costco, so the 2% rewards check ends up paying for my whole membership fee. It’s like shopping at Costco for free! Some of the deals I get at Costco are hard to beat, but you have to come up with ways to use fresh foods bought in bulk before they go bad. The price of a fresh pineapple at Costco is the lowest I’ve seen at $2.99 pretty much year round. 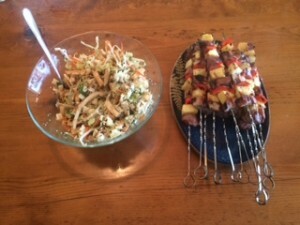 I really loved grilled fruit, so I paired the pineapple with some pork and peppers on a grilled kabob. I also stocked up on some pork loin the last time Costco ran it for $2 off a package. My tip for using up 6 plus pounds of the pork loin is to slice it into portion, about 1.5 lbs for my family, and stick it in freezer bags in different types of marinades BEFORE freezing. 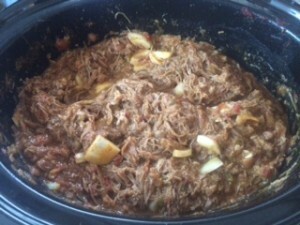 As the meat is dropping in temperature to freezing, the marinade will penetrate the meat. I also found that the salt content of the marinade helps prevent freezer burn. As the meat is thawing, the marinade also gets into the meat. With the last 8 pound pork loin I bought, I made 5 package of meat in 2 different marinates. 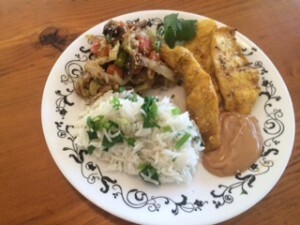 The first was a lemon, rosemary, and garlic marinade, and the other was an Asian marinade that I added a squirt of sriracha to. I used the Asian marinated pork for the kabobs. The rosemary for the marinade was out of my container garden. 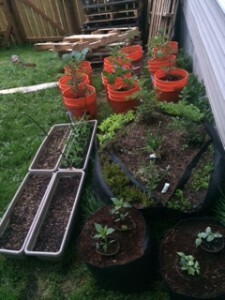 I have various veggies and herbs planted in big orange buckets from Home Depot. The buckets are cheap and easy to move, so they work well with our Mussgo lifestyle. My mother in law told me while she was visiting that an old saying says “where Rosemary flourishes, the Woman rules” and in England it was believed that rosemary could not grow in the garden unless the mistress was the master of the home. 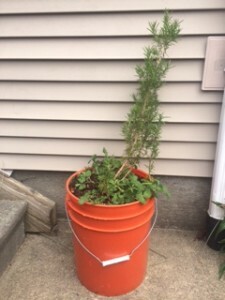 I don’t know if that’s true, but my rosemary is growing really well. Anyway, lets get on to the menu and the ways I used all fresh produce I bought from Costco including asparagus, pineapple, mushrooms, and summer squash. Mix all ingredients over medium heat in saucepan until melted and warm. This sauce is so simple and so delicious! It is great over pasta or spaghetti squash, as a dip for bread, or over veggies…heck I would probably eat anything covered in this sauce! Make sure you check out Marcy’s blog and read her heartwarming posts she writes about faith and family and her experiences with infertility & adoption. Well, I must go water my garden now that I am thinking about it. Enjoy this weeks meals!